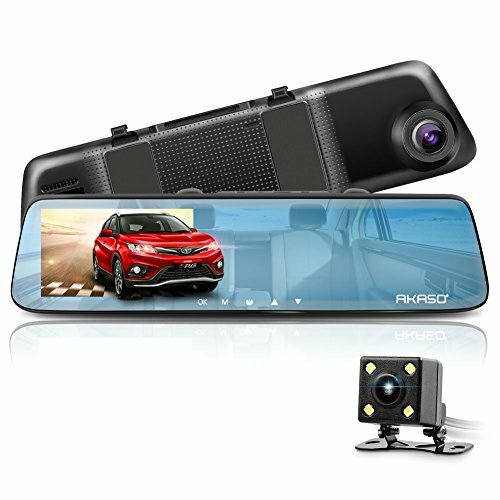 Never Miss a License Plate: The dash cam is full HD 1920x1080P/ 30FPS, Advanced sensors capture clearer license plates and details displayed in 5.0 inch screen, 170 degree super wide-angel monitors 4 lanes. Reverse Image: With a clear car backup image (480P) guide when reversing, the dash camera helps you reverse your car and avoid unexpected with guide lines. Built-sensitive G-sensor activates the car camera to record emergency video when encounter collision, parking monitoring and mobile detection function to help you record the unexpected accident. Package Includes: User Manual/ Straps/ User Manual/ AKASO DL2 Dash Cam/ Rear Camera/ Rear Camera Extension Cable(19ft)/ front Charging Cable (12ft), if you need install video please contact us, Mic SD card not included, 32GB Samsung or SanDisk class 10 SD card recommended.